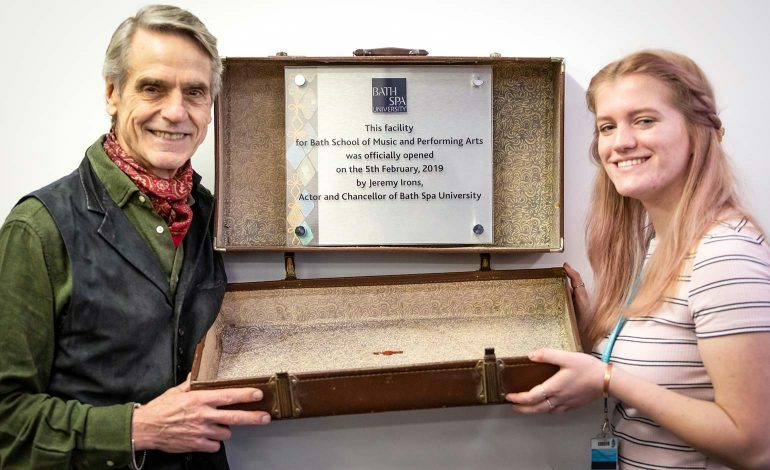 Bath Spa University Chancellor and Oscar-winning actor Jeremy Irons was in the city on Tuesday, 5th February, to officially open the new Oldfield Park Theatre Workshops. The site in Oldfield Park is home to a new, purpose-built facility designed to replicate the real-world production process of staging theatre performances. The University’s Chancellor joined third year Acting student, Joe Topping, and third year Theatre Production student, Imogen Howarth, on a tour of the new facility, which will allow students studying for degrees in Theatre and Digital Production and Acting to work and study in a connected environment – fully preparing them for life after university and in their chosen career paths. “I was delighted to officially open Oldfield Park Theatre Workshops today,” Mr Irons said. “It will enable students to share the experience of the processes involved in staging a theatrical performance, and from talking to the students today, I know they appreciate and will make the most of these spectacular facilities. Imogen Howarth, the third year Theatre Production student that joined Jeremy for the opening, added: “The Oldfield Park space is amazing. It’s really helping us to work more collaboratively and to better understand each other’s courses. “It’s also really useful for production students because everything is much closer together geographically, which allows us to cut down the time spent going in between spaces. Mark Langley, Head of Bath School of Music and Performing Arts at Bath Spa University, added: “It’s rare that a university is able to provide an all-in-one, industry-standard facility for these disciplines, so we’re delighted to be able to offer this for our students at Oldfield Park Theatre Workshops. The Oldfield Park Theatre Workshops are based on Westmoreland Station Road.